If you cut off a spider’s head, it dies. But if you cut off a starfish’s leg, it grows a new one, and that leg can grow into an entirely new starfish. Traditional top-down organizations are like spiders, but now starfish organizations are changing the face of business and the world. After five years of ground-breaking research, Ori Brafman and Rod A. Beckstrom share some unexpected answers, gripping stories, and a tapestry of unlikely connections. The Starfish and the Spider argues that organizations fall into two categories: traditional “spiders,” which have a rigid hierarchy and top-down leadership, and revolutionary “starfish,” which rely on the power of peer relationships. It reveals how established companies and institutions, from IBM to Intuit to the U.S. government, are also learning how to incorporate starfish principles to achieve success. I’m a bit late to this, for The Starfish and the Spider was quite the darling of business book readers when it was published in 2006, and reading it now I can understand why. In the new Epilogue written for this edition, author Ori Brafman talks about “speaking starfish” saying, “it’s been exciting to see Starfish provide a language for people to describe their organizations,” something I can definitely understand and echo, for clear vocabulary and a strong language of intention is key in effectively communicating any business model. Besides the starfish (decentralized organizations) and spider (centralized, more tradition ones with heavy top level power players), Brafman and Beckstrom make the roles of catalyst and champion sound very appealing (in comparison to the CEO) in both types of organizations. I was relieved that they spoke of ideology as much as they did however, (i.e. and the importance of values), knowing how much this book has resonated in the business community. Their pitch is clear: The more successful organizations today are likely to be those who find their “sweet spot” between starfish and spider behaviors as “hybrid organizations” willing to change as the market demands. The authors offer several case studies, making Starfish a very quick and interesting read; this book is terrific for a corporate book club when there’s a genuine desire to be open-minded, creative, and more innovative — the book is clearly a great conversation starter, and can inspire change. I can also see how it would foster more reading of related works, such as Malcolm Gladwell’s Tipping Point, James Surowiecki’s Wisdom of Crowds, and Seth Godin’s Tribes. Much as I love playing in the world of business, the story which appealed to me most however, was about the Apache, and I found myself wanting to hear about more societal starfish movements; I’ll bet this book has a strong following in the Tea Party and newly emerging People’s Party movements. Why Goodreads? They have become an App Smart choice for me in 2011 for I want to return to more book reading, and have set a goal to read at least 36 books this year (this was book 10 for me). Read more about the Goodreads mission here, and let’s connect there if you decide to try it too! You can also follow them on Twitter. 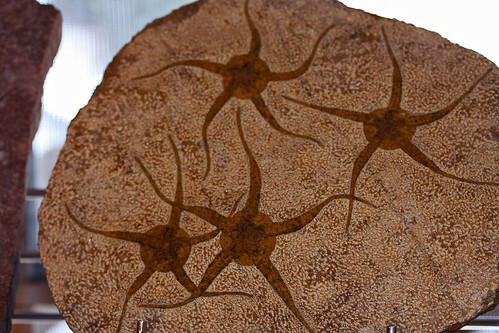 Above: An exposed fossil slab from the Sahara: Starfish have been around for a very long time. There are a lot of photos taken of starfish, but this one appealed to me as a reminder of how the authors speak of “Circles” as small, non-hierarchical groups which are independent and autonomous. The major principles of decentralization, as discussed by the authors: Italics is theirs, verbatim, commentary is mine. When attacked, a decentralized organization tends to become even more open and decentralized. Example given: Story of the Apache, and what happened when a centralized body and coercive system (the Spanish) tried to take on an open system (the Apache.) In short, the Spanish lost. An open system doesn’t have central intelligence; the intelligence is spread throughout the system. Culling this intelligence, and giving it the respect it’s due, is to me one of the greatest promises of more decentralization. Open systems can easily mutate. Example given: The open system of Alcoholics Anonymous, bound only by the ideology of the twelve-step model. The decentralized organization sneaks up on you. Because starfish mutate so quickly, their colonies can also grow with incredible speed; they can take over an entire industry in the blink of an eye. As industries become decentralized, overall profits decrease. Introduce starfish into the equation and wave goodbye to high profits. Revenue is not a bad thing, and this quandary is what a hybrid organization must reconcile with. Put people into an open system and they’ll automatically want to contribute. I found this to be a big assumption, but I like it if the data truly backs it up! Example given here (and it’s a good one) was Wikipedia. When attacked, centralized organizations tend to become even more centralized. They hunker down. Example given: Research labs have gone underground to curb attacks by ALF activists (Animal Liberation Front). Circles. Today we are seeing how circles of people gain freedom and flexibility when they go virtual, but physical presence is still most powerful. 12~ Receding. After catalysts map a network, make connections, build trust, and inspire people to act, they leave. Ideology. It’s not just about community (lots of organizations offer community), not just about getting stuff for free, not just about freedom and trust. Ideology is the glue that holds decentralized organizations together. The Preexisting Network. The Quakers would help Granville Sharp combat slavery in Great Britain. The Champion. A champion is relentless in promoting a new idea. Granville Sharp needed the dedication and tenacity of his champion, Thomas Clarkson. Catalysts are charismatic, but champions take it to the next level; there’s nothing subtle about the champion. Rule 2: The Network Effect: “Often without spending a dime, starfish organizations create communities where each new member adds value to the larger network.